Outlandish Observations: Happy Chinese New Year! "Bloody man!" I said, exasperation mingled with pity--and a slight feeling of alarm. The ten hours of a Channel crossing were one thing; what would his state be like after two months of this? "Head of pig," Mr. Willoughby agreed with a lugubrious nod. "He is rat, you think, or maybe dragon?" "He smells like a whole zoo," I said. "Why dragon, though?" "One is born in Year of Dragon, Year of Rat, Year of Sheep, Year of Horse," Mr. Willoughby explained. "Being different, each year, different people. You are knowing is Tsei-mi rat, or dragon?" "You mean which year was he born in?" I had vague memories of the menus in Chinese restaurants, decorated with the animals of the Chinese zodiac, with explanations of the supposed character traits of those born in each year. "It was 1721, but I don't know offhand which animal that was the year of." "I am thinking rat," said Mr. Willoughby, looking thoughtfully at the tangle of bedclothes, which were heaving in a mildly agitated manner. "Rat very clever, very lucky. But dragon, too, could be. He is most lusty in bed, Tsei-mi? Dragons most passionate people." I wonder what animal Tsei-mi is..Never thought to look it up. Thanks for looking that up! I can't say I'm surprised, considering Jamie's stubbornness. Ox fits pretty well. 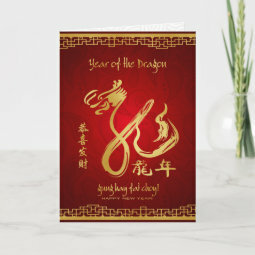 For all those born in the year of the Dragon... Chinese say you should wear something read for the whole year to ward-off evil spirits which are particularly keen on making you suffer during your "bengmingnian" (the year of your sign).